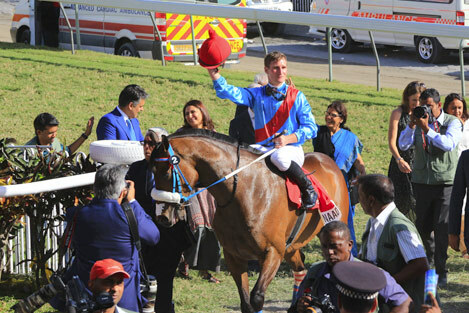 Daniel Stackhouse has added yet another feather to the bulging cap he has steadily been building up in Mauritius since May with a grandstand win in the biggest race on the Island Ocean island on Sunday, the Group 1 Air Mauritius Maiden Cup (2400m). The Victorian jockey rode favourite Enaad to a thrilling last-gasp victory in the richest race (purse of 2 million Mauritian rupees which is worth around A$80,000) on the Mauritian calendar. The Soun Gujadhur-trained South African-bred High Chaparral seven-year-old, whose only previous victory in Mauritius came in last year’s Maiden Cup, as a result, joined an elite band of three previous winners to have won the time-honoured race twice. It was Stackhouse’s predecessor, fellow Victorian-based jockey Steven Arnold, who was aboard Enaad at the first hurrah last year. All day at the country’s version of the Melbourne Cup, throngs of racegoers had fought for the best vantage spots around the tiny 1,298m-long Champ de Mars racecourse, both infield and in the wafer-thin-looking but sturdy stands packed to the rafters, eager to witness another piece of the 206-year-old Club’s rich history being rewritten. But when stablemate and designated pacemaker The Great One (one of four runners fielded by the Gujadhurs, the oldest racing stable in Mauritius) kicked clear in the rising 250-m long home straight, Enaad’s historic bid was teetering on the brink of failure. Though Stackhouse had taken no chance by launching the proven stayer from the 800m mark, manfully skirting around the capacity 11-horse field three wide, he was still spotting the leader around four lengths upon straightening up - and more tellingly, not pinging the way he did at his 2017 win when he had already put his rivals to the sword. The Great One looked home and hosed with Mauritian jockey Swapneel Rama all set to steal the honours for the local boys, but that last uphill climb to the winning post took its toll in the end. Stackhouse had after all timed his run to perfection, confident in Enaad’s superior staying prowess kicking in in good time – and how he sprouted wings inside the last 50 yards, collaring his stablemate close home to down him by a neck. As the crowd, especially the legion of Gujadhur fans clad in turquoise blue and red, went hysterical, regardless of who won as long as it was a blue and red sash jacket first, the whole Champ de Mars stood up as one to applaud Enaad, the Gujadhurs and Stackhouse. Definitely used to more subdued back-to-scales welcomes at home, the New Zealand boy might have in the last four months become more exposed to that unbridled eruption of wild and raucous cheers from the racing-mad Mauritians when a winner is led in – he has already booted home 15 previous winners in only 65 rides before Enaad, including his first Group 1 winner Table Bay in the Barbé Cup back in June – but he said he had never experienced anything like Sunday’s euphoria. “The crowd went mad, they were cheering and chanting. It was just amazing, you have to be there to feel this unique experience,” said the 28-year-old jockey. “All week, the whole island has been talking about the Maiden and with Enaad being the favourite, there was of course a bit of pressure. But I’ve stayed focused on the race, just treating it like any other race, and blanking out all the other distractions. “I didn’t panic during the race - well, I think I didn’t, even if The Great One, who is a very good horse, looked to have pinched a big break coming to the turn. “Enaad took a while to get there, but they had gone really quick, and as he is a genuine stayer, he got there on the line. To be honest, I didn’t really like him the first time I rode him in trackwork around a month ago. “But when he goes on grass, he’s a totally different horse. At my first ride, he gave weight all round and ran a very good second, which surprised me. “On that run, I knew I had to ride him in the Maiden at level weights, especially after his last grass gallop on Tuesday, even if The Great One was also a good option. I’m glad I’ve pulled the right rein again after Table Bay (four other stablemates ran then). “I wish my wife Jana and parents were here to share that moment. My parents were actually at the races last week as they were visiting Thailand and decided to make a detour here to see me ride, but they couldn’t stay for the Maiden Cup. “But it’s okay, they saw me win a race last week. They had a lot of fun and got a pretty good idea of what racing is like in Mauritius. With 14 meetings left in the season, Stackhouse can’t afford to sleep on his laurels even if he has won two Legs of the Mauritian Grand Slam, with the last Leg, the Group 1 Duke of York Cup (1600m) due on November 3. He is also sitting in second place on the jockeys’ log despite joining late, two months into the season, only two winners behind South Africa’s but recently Brisbane-based jockey, Robbie Fradd. “There is another Group 1 race next Saturday, the Princess Margaret Cup. Table Bay will run and I’d like to win that race for Mr Soun as he’s never won it as a trainer, even if the family did win it in the past,” said Stackhouse. “With the big prizemoney from the 1-2 in the Maiden Cup, we’re now on top in the stable championship. Hopefully, I can help them stay on top and become champion again. “As for myself, it’s going to be close with Robbie. His stable has a lot of good horses, too, so let’s see how things pan out, but we should not forget JP van der Merwe and local rider Jameer Allyhosain who are not far behind on 15 winners. The Mauritius racing season from which the different premierships are decided ends on November 24, but the grand final is the International Jockeys’ Weekend on December 1 and 2, to which the newly-crowned Mauritius champion jockey gets an automatic ticket. Arnold was joint-Mauritian champion jockey with India’s Imran Chisty last year, but declined the invitation to ride in the series. Luke Nolen represented Australia, but was injured after Day 1 and was stood down midway through Day 2.